I was a bit leery of the whole canned meat thing when I first started homesteading. 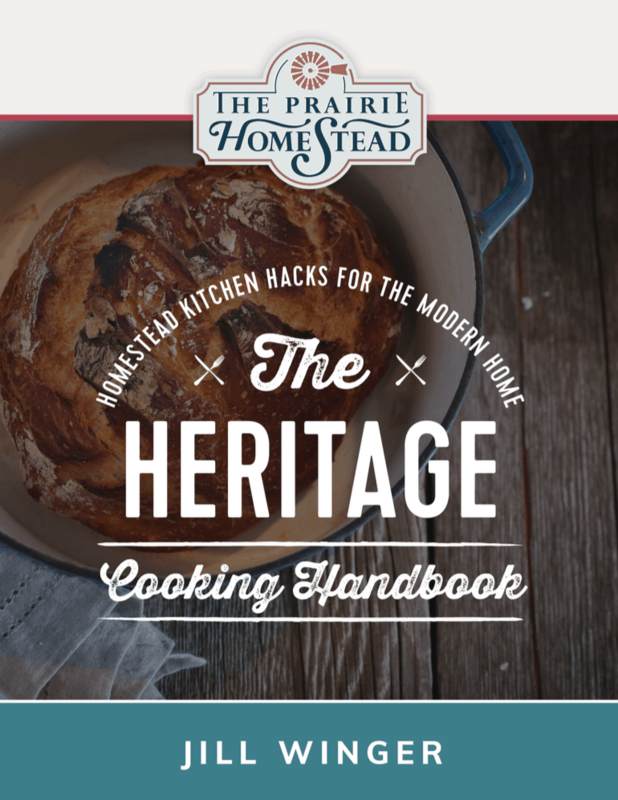 Thankfully, canning meat at home is a whole different ballgame, and a skill you’ll definitely want to add to your homestead repertoire. Plus it’s really not any more difficult than canning veggies. Honest! 2. It saves on freezer space. We have two freezers out in our barn, but they are ALWAYS too full, no matter what I do. Anytime I can store food at room temperature, it’s a huge plus for me. 4. It tastes darn good. Really! 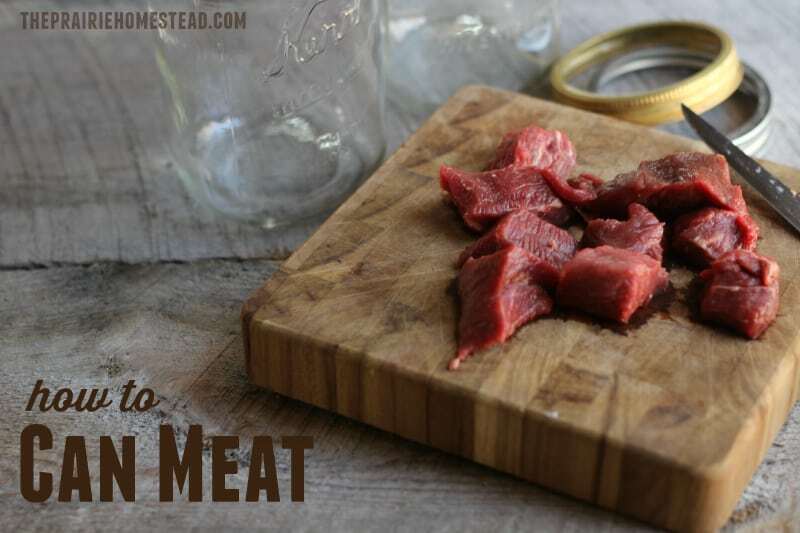 Home canned meat is tender, juicy, and can be seasoned however you like. You must, must, must use a pressure canner if you plan on canning meat– no exceptions. Since meat is a low-acid food, a regular boiling-water canner will not be able to heat it at a high enough temp to make it safe for storage. I know pressure canners may seem intimidating at first, but they are actually simpler than you think. I have a full pressure canning tutorial here. It’ll walk you through the process, and teach you how to pressure can without blowing up your house (always a good thing). OK, enough chit-chat. Let’s start canning meat! Slice into strips against the grain, and then cut into roughly 1″ cubes (just eyeball it– no need to be exact). The goal here is to simply brown the cubes— you don’t need to cook them all the way through. Place the browned meat cubes into clean glass jars, leaving 1″ headspace. If using quart jars, add 1 teaspoon of salt. If using pint jars, add 1/2 teaspoon of salt. Pour water (how much you need will depend on how many jars you are canning) into the pot you used to brown the meat, and bring it to a boil. This will capture all the lovely bits from the bottom of the pot and create extra flavor in your finished product. Ladle the boiling water over the meat in the jars, leaving 1″ headspace. Use 10 pounds of pressure, UNLESS you are 1,000 feet or more above sea level. If that is the case, increase to 15 pounds of pressure. I don’t have exact amounts for this recipe, because it just depends on what you have available. You can either start canning meat immediately after butchering, or save back several of the tougher cuts to can later. The salt is entirely optional and only added for flavor, not for any preservation benefits. Add your melt-in-your-mouth canned meat to soups, stews, casseroles, skillets suppers, or just warm it up and eat it out of the jar. It’s also possible to can ground meat, soups, and stews. Those tutorials will be coming soon! 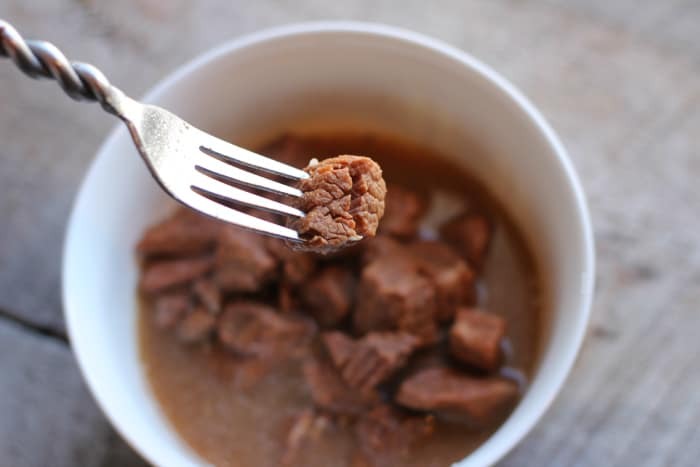 how to can beef, venison, or elk with a pressure canner for fork-tender meat! In Romania’s countryside people who are raising pigs are using almost the same process as described here. The exception is that instead of water they are using the pig’s melted lard. Thus no need for a pressure canner. The jars are placed on a metal plate to absorb the heat of the lard and prevent them from breaking. Afterwards, the jars are left to cool down, then placed in storage. Because of the lard the meat becomes very tasty. And it can last for a year, without becoming rancid. Is that pork confit then? 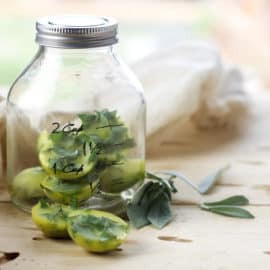 I love to hear about the traditional methods used to preserve food (esp meats) but that sounds a bit scary if they make a vaccuum in the jar without the pressure canning to ensure it gets hot enough. But then again, if that’s how it was always done…. my pressure cooker on the frizt,s I already browned my meat, will it be ok to put my browned meat in the fridge, then when my new cooker comes in two day, put the meat in jars then pressure cook, or does the meat have to be warm. It’s great to see this post, a lot of my friends think its absolutely crazy to can meats. We have been doing it for a long time though. I love how you de-mystify skills and empower folks with your posts! I have so far pressure canned turkey, duck (from older layers) and pork stock, but not any red meat yet. I think the energy/freezer space issue is what really draws me to this method of putting up meats, plus the tenderizing effect on older poultry muscle is quite amazing.The ONLY downside I have about pressure canning is how log it takes per batch, I need 2 so I can tandem pressure can, hahaha! I also pressure can dry beans, a great thing to do in winter when you don’t mind the stove heating all day. So much cheaper than store bought canned! I agree! Having a second canner would be awesome! If you haven’t, maybe you could do a blog on canning dried beans? I love that idea! I love pressure canning. I haven’t done beef yet. I have canned a lot of chicken. My MIL canned venison and she used it in sandwiches. Yes, anything that can be stored in anything other than one of my freezers is a huge plus. Is the salt canning salt, or regular table salt? I use regular sea salt. I’m a huge fan of canning….but have stayed clear of canning meat…or even using a pressure cooker. I know it would be an adventure worth taking up, but I guess you could say…I’m also a bit “leary.” –thanks for the post!! I have to admit, the thought of canned meat has always sounded incredibly unappealing to me! You have MAYBE POSSIBLY convinced me to try it 🙂 thanks for a great tutorial! I have also been a little leery of canning meats and it is for the exact reason you mentioned. I’ll have to give it a try. Thanks for the post!! Thank you for the recipe, Jill. I usually don’t precook the meat. 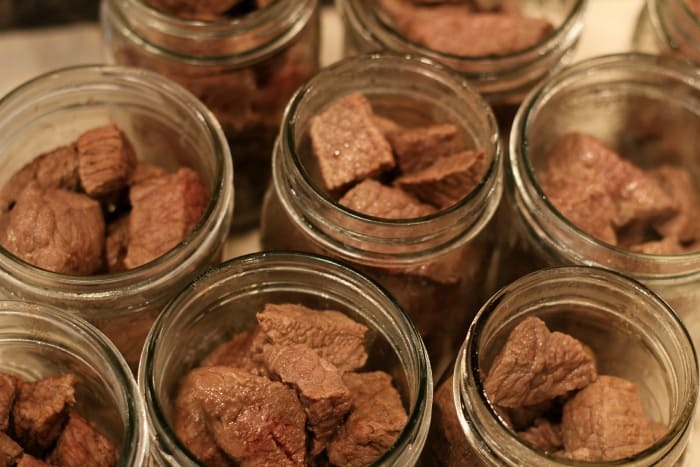 I cut the toughest parts of the deer into 1″ cubes and pack them raw into pint jars. I add just a pinch of canning salt (iodine free) and top with water leaving 1″ below the rim. Then I can at 15 psi of pressure for 90 minutes. It really softens the otherwise tough deer cuts. I bet your method will be very good with milder meet like pork. Hm! My grandpa said his mother used to can sausage. We actually just talked about this topic this past summer. He said that she would cook up the sausage, place the sausage in the jars, pour the grease into the jars, seal them, then flip them upside down. As they cooled it would seal the jars. Anyone else ever heard of this? Would it be safe? It was good enough for them but would their be risks associated with it? Yes where I live its still very popular. They also can liverwurst right after butchering hmm.from pork. I know this was a method that was used a lot in the past. However, many of the more modern canning agencies don’t recommend it. The reason they don’t recommend that method anymore is purely CYA to prevent someone who doesn’t do it right and gets sick from suing them. It is the same reason manufacturers today recommend Refrigerate After Opening for things like Ketchup, Mustard, Pickles, Olives, and a whole host of other things that are fully preserved by their nature. There are three ways to preserve food products without canning. They are pickling (the use of vinegar), candying (the use of sugar), and curing (the use of salt). Just don’t store these items in high heat, such as outside in the sun, and they can last for years. Eventually, taste will suffer, but that usually takes many months, well into multiple years. Don’t forget drying. I have made jerky and dried ground beef. My father use to can wild game, homemade sausage, meatballs, sauce and meatballs, lard,…. darn near anything. For the meats, he diligently cleaned and then boiled the jars, added the cooked contents (or partly cooked) then into the boil bath. It always worked and I remember being amazed as a kid eating fresh rabbit we jared 8 months prior. That’s the way they did it in the old country. I have just canned lots of chicken, but no other meats. Hope to soon. I’ve heard really good things about Zaycon– their meats are definitely perfect for this! i have been using this method for years for canning fish (salmon and trout). of course, i don’t cook it first, just cut it up into large chunks and pack it tightly into the jars. i do put non-iodized salt in the jar. i leave the skin on to get more flavor into the meat. but then i have to scrape the skin off when i use it, or else when i mix it up it looks gray and ugly. but if i remove the skin before canning it, it just doesn’t have all that good flavor from the fat. then i process it as you described. so much better than store bought tuna. Very cool! I hadn’t even thought about canning fish! I was thinking about asking if canning like this would be good for fish. So now I know. But why does it have to be non-iodized salt? Thank you!! This answered my question. I have canned a lot of broths, soups, beans and vegetables with my Presto pressure canner. Salmon in the past too. I like to smoke it first then can it, Salmon is great this way. Haven’t tried canning red meats yet, soon though. Thanks for all the info and blogs, I love reading what everyone else is doing. Can anyone suggest a good pressure canner? I have a pressure cooker but it does not have a guage on it. I am new to canning and I am hoping to start this summer becoming more self sufficient. We have had our chickens for almost a year and I am eager to start relying more on what I grow than what I get at the grocery store. 2 kinds of pressure cookers – with and without gasket; I’ve use ‘Mirror” pressure cooker (with gasket, replaced x1) for years. But if I upgrade/replace, I’ll try the gasket-less model. Either way, just follow the instructions with the canner. I LOVE the All-American! http://amzn.to/1z7jqG1 (aff link) SO happy I invested in it. I just got an AA for my birthday and simply love it. I have just canned spaghetti sauce with ground beef and sausage and it came out just great. Its on now… I have canning fever! My opinion only, but All American Canner is the only one I would ever consider. Bottom line: They aren’t cheap, but it literally can’t get any better. Metal to metal seal means no replacement parts ever. I, too, was leery and afraid of food poisoning, but my dh convinced me to try canning meat. We canned chicken breasts, cut them in half and put them in pint-jars. Our BH&G canning cookbook stressed that you must boil the meat for ten minutes before tasting (to avoid any food poisoning), so I always do. It’s wonderful to go to the garage, pick-up my canned chicken, and use it for soups, taco/burrito casseroles, anything is made so muck quicker! I have been canning beef, pork, chicken ,venison, hamberger for many years. I cut red meats enough to fit in the jar, raw packed, no water added, it makes it’s own juice in the jar…. For venison, I add beef bullion, powdered onion soup mix, it takes away the wild taste. You can throw in real onions too. 10 lbs pressure for 90 minutes. We have eaten canned beef that was 17 years in the jar, it was wonderful… One thing I would like to add,,, canned meat does not look appealing in the jar.. I agree Deb– it’s not super appetizing in the jar, but sure tastes good! I love your onion idea! lol! I can imagine it doesn’t look so great! We are in the process right now of canning beef. I use beef bullion instead of salt and I brown my meat before I put it in the bottles. We also save the juice and tasty bits from the pan we use to brown it and add that to the bottles. It comes out of the pressure canner with a deep brown color we find very pleasing and appetizing. The appearance is the whole reason my adult son will not eat it. I try to tell him he is missing some good tasty meals. I am new to your website and I love it! Thank you for putting your time into it, I have learned so much. I am new to canning and my question is, how long can canned meat, veggies, jams etc., be stored for? I have heard anywhere from 1 – 3 years, but wanted to see if that was more or less the time line you or your readers used? Or if normally it would be up to one year? What scares me about long-time storage is the quality of the canning lids; I’ve often opened a jar of various canned products from soups to fish and the lids have corosion on them, just to be clear the corosion is on the inside. Was something done improperly regarding the method of canning? What in your opinion is the best brand of lids? I always but ball canning lids. I talked with a certified master canned and she said after the canning process remove the bands. This way if the seal was not good you will know. If you have the band on the lid can actually reseal if it came loose. It will grow harmful bacteria. Is there anything different I need to do with canning chicken than other meats? I have a lot of chicken in the freezer, as we butchered recently. I would like to make some room in the freezer. Besides, it’s now winter, and good time to can what I have available. My mom gave me a pressure canner for Christmas a couple years ago and it sat in my basement because I was terrified to use it…I just knew that I was going to blow up my house. My sister in law and I decided to get together and be courageous and we can a hundred pounds of chicken. It was amazneing and life changing! we called the butcher and asked where the price breaks were to get a great deal and we ended up getting chicken tenders for a 1.75 a pound. we took the fresh chicken tenders and put the raw chicken right into the pint jars no salt needed no water needed and pressure can them for 75 minutes at 13 pounds of pressure for our elevation. we get one pound of meat per pint and it gives us about a half cup of broth makes about a half cup of broth. we use it for everything from sweet and sour chicken two enchiladas and chicken salad sandwiches and Hawaiian haystacks. It shreds like a dream! We have also tried boneless spare ribs and they are processed the exact same way and come out tasting just like they came out of the slow cooker. The fat cools on top but I think it adds more flavor. 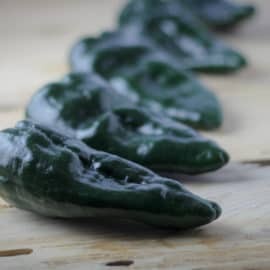 we use these for sweet pork burritos and barbecue pork sandwiches they are delicious! I am so glad that you posted this tutorial it will hopefully let people realize that it’s not so scary and it’s worth the effort. Very addicting….. then I’m thinking what did I get myself into. ?. I just took my quarts of elk out and and I have my chile con elk (carne) in now. I’m only a few years into canning but I have my husbands grandmother to help which is always very supurb! Awwww… thank you so much Debbie! I love having you as a reader!! My husband cans a lot of meat…venison is his favorite. He uses it for so many different meals, including stews and soups. reply to couch: regarding salt. i use non-iodized salt because that is how i was taught. not sure why. i know when we smoke fish, all the recipes say to use non-iodized salt. maybe some sort of reaction between the fish and iodine??? table salt, aka iodized salt, contains ingredients to keep the salt from caking. during canning, at least with pickles, it makes for a cloudy brine. the table salt may contain some form of thickener, like corn starch, and that is another reason we aren’t supposed to use it. hope this helps. Oh! 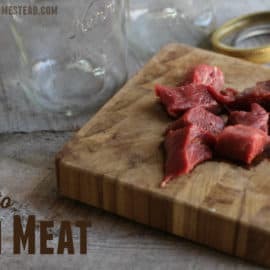 Thank you so much for this blog about canning meat. My husband grew up ranching and his mom canned meat. He’s been saying for years he wants to can some but we didn’t know how. Unfortunately, I didn’t get his mom to teach me before she passed away a few years ago. My husband and his brothers all want to get together and can. So this year at the holidays we will be canning meat together. Of course, I’ll try it out before then. I’ve been meaning to write and tell you I’ve actually been to Chugwater. I thought it was so cool! I lived in Oklahoma back then but now live in the mountains West of Denver. So we are relatively close neighbors. We live at 8,100 feet. Your info for high altitude is so appreciated! It’s hard to find good info. I’ve really been exploring more natural ways of living. I’m so happy I found you! I’m a fan! We are practically neighbors! 🙂 I’m glad you found me, too! So, some of you are canning meats cold & raw packed in the jar……and with NO WATER or ANY LIQUID ADDED? I would have thought this was not possible. Do you use quart size jars and add salt? I pack raw venison which is typically very lean so little to no fat. I add 1 tspn creole seasoning (salt would work just fine, just prefer this flavor that seems to not be overwhelming in any recipe after canned) and 1 tlbs beef broth or stock. That’s it. Can at 10 lbs pressure for 99 minutes. Every single Har is filled to the top with its own juices when done. Very good. Super easy and most important so quick to get in the jars! And I am using quarts. Ok so now I’m a bit confused..if using this method by not adding any liquid and it makes enough of its own liquid to come out perfect then it doesn’t make sense to add liquid to measure at 1″ below the rim because isn’t that then going to be too much liquid and explode inside the cooker during cooking? I have been cannon meat for about 2 yrs now. My absolute favorite is venison, we pack raw and can and it makes its own broth. Someone mentioned it’s better then Dinty Moore, and they are right!! Brown an onion and some garlic then add you can of venison, a can of carrots and cut up left over baked potatoes. Warm together. Salt and pepper to suite. Serve with noodles or rice!! Such a fast and filling meal!! Thanks for the tutorial!!! Well thank for your awesome posts! I’ve wanted to do this, because our freezer gets so unbelievably full. 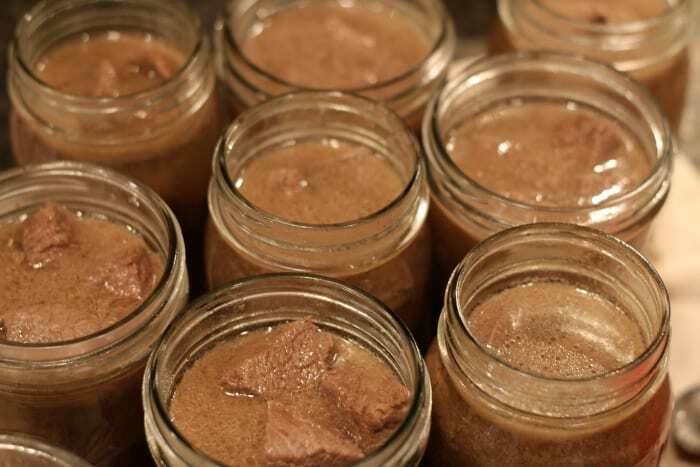 Plus how amazing would it be to have jars of meat ready to go–no thawing required! Can’t wait to read your posts about canning soups and stews! How long does the meat last after being canned? 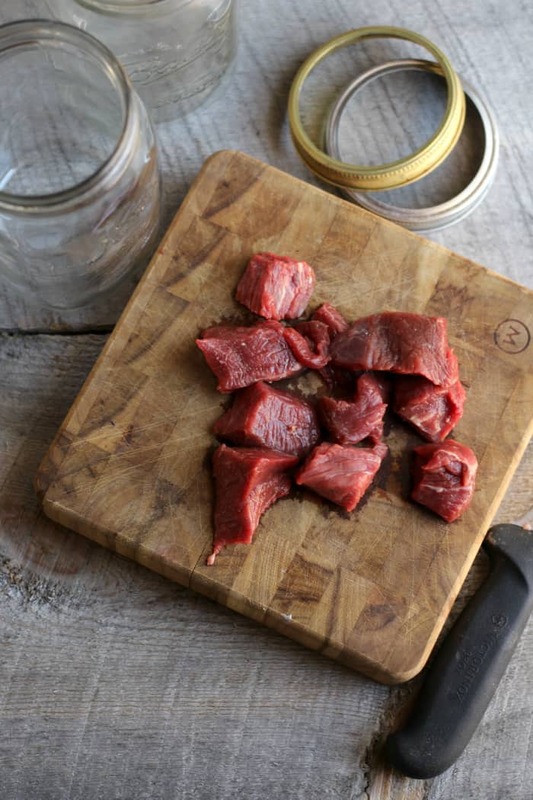 A woman gave me two jars of canned venison years ago, and I’ve been telling everyone ever since….it was THE BEST meat I’ve ever had in my entire life! No joke! I already love venison, but what was cool is that canning it gave it an entirely new flavor. It was like discovering a new meat! And she told me all she did is add 1 tsp of salt and water…nothing else. I can’t wait to start canning beef, and venison (hubby has to get a deer first, lol)…but I’m kind of stuck right now. I have a wonderful T-Fal pressure cooker that I got about 15 years ago, and it works wonderfully…but I have no idea how much pressure it cooks at? Even if I could find manufacturer specs, I’ve been told that with age pressure cookers can lose their pressure, so how do I know for sure it’s got 15 lbs? I’m over 1100 feet above sea level, so have to do 15… Any suggestions how to test pressure? You will probably need a pressure canner, versus a pressure cooker. 🙂 Sometimes local extension offices can help you test pressure, though. Thank you…I will start shopping, I guess, lol! If its lifting your 15 pound pressure waite to let off steam it has 15 pounds of pressure. I have canned pinto beans before using your tutorial and have had great results. However, to save time, I was wondering if it is possible to fill all of my jars with food at the beginning of the canning session and keep them hot in the dishwasher, adding them to the canner during the day as it is ready for them. Hmmm… I’ve never tried that, although I suppose it might work, as long as it kept the food/jars sufficiently hot. I would love some recipes for the meal. I canned pork this summer. 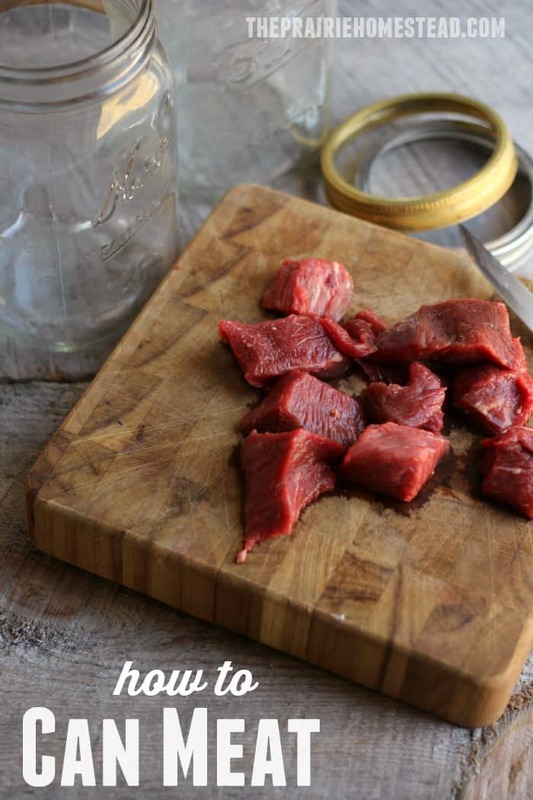 Wondering what cuts of beef you use for canning??? I would love to try beef but don’t know the differences. Thank you! Freezer space is expensive and there’s never enough of it. Why does canned meat make me feel like I’m on Fear Factor? Progresso’s been doing it for years! Open minds – I’m coming around! LOL! It does take a bit of a mindset shift, huh? Hi Jill, love your posts! I get so excited when I read them and can’t wait to try something you’ve already done. Last year I did beef stew and Bolognese sauce. We bought the next to the largest size pressure canner from Amazon. It was great to just open up a jar when hubby and my son came in for lunch in the middle of winter and I’d have homemade bread ready. I was very popular. My Bolognese sauce was good but could have been better. I cooked it all the way so when I put it in the pressure canner for the amount of time to can it it had lost some flavor. I have since spoken to an expert at an extension center and she didn’t go along with me canning my recipe because it had wine and milk in it. She strongly recommended I leave out the milk. I will make and can it again but will leave out the milk or cream and add it when I heat it up and cook it out a little more. I didn’t can my beef stew yet because I was very busy in the fall so I’ll be doing it soon. I just put the stew meat in a container in the freezer which is taken up room. Well, ciao for now and thanks so much for sharing . I’ve canned chicken for many years. Partly because my Mom did when I was growing up. It is so convenient! Definitely a fast food when you’re in a hurry! Whe I can chicken I’m left with all the backs which I use to make stock (which I also can). We buy a years worth of chicken at a time from a local farmer so canning some saves a bit of room in the freezer for other things. This year we had some beef roasts and steaks from our yearly purchase that were quite tough so we canned them. It’s been so great! Nice and tender, and a quick meal when we’re in a hurry. So smart Miranda– way to go! Our electric was off one winter for 17 days and the freezer was full! We canned hamburger cooked in tomato juice, everything else was canned raw: chicken tenders, chicken legs and thighs (we feed the soft bones to the dog when we open a jar), brisket, a roast and salmon. It saved our food from having to be thrown out. Its a great idea to can meat! Oh dear… that is my worst nightmare! But sounds like you did a great job of salvaging everything! I have been canning for quite some time and have an extensive inventory of meat, veggies and fruit. I love to can and bake but don’t have recipes for cooking with canned meat. (And I am not very creative in that area). Any suggestions for cookbooks or recipes to help with making good meals with what I have already canned? It gets kinda boring just warming stuff up. I used my canned venison just like I would if raw. It’s just quicker! I made barley soup with it yesterday. Just added my canned venison without draining as the broth is delicious. I’ve also used in my crockpot for a stroganoff. Hash. Anything you would use it for it works perfectly with less cooking time! I’m sure someone has already shared this, but just in case, I pack my venison raw. Cut up chunks, doesn’t matter what size as long as they fit in jar. Pack it in. I add tspn of creole seasonings and 1 tlbs beef broth. That’s it. No more water. Cook at 10 lbs pressure for 90 minutes. When finished the jar is filled with its own juices. Meat is fork tender. So quick and easy my husband enjoys doing it! I just killed a nice young cow moose this past w/e. Am excited to try it in different ways and my mother-in-law has agreed to help me can some, as she has all the equipment. My question is should it be canned plain, various spices, if so, what are some good combos? I’ve never canned moose (does it have a strong flavor? ), but I would think at least some garlic power and salt/pepper would be a nice addition. I am brand new to this. I have some experience, as I helped a friend a few years ago, who has been canning venison from a recipe over several generations old. So after witnessing this & reaping the benefits of this deliciousness I want to give it a try. My first task will be chicken & beef. 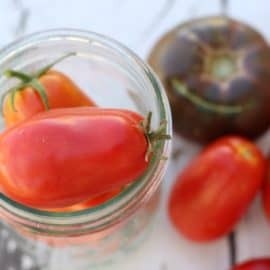 Can anyone recommend canning jars? I know they’ve become popular for decoration so not sure where to get the “canning” jars. Any help is very much appreciated!!! Your local grocery store (or a Target or Walmart) will have them. My wife don’t want me to get a pressure canner,I think she’s afraid it will blow up. She watches to much news I guess. How long after you can meat do you wait to try it? Someone told me 1-2 months. I’ve eaten it right away. Although I imagine letting it sit might slightly improve flavor? This is awesome. I’ve gotta try this next time I get a deer which hopefully should be soon. Thanks for the good write up! Oddly enough, I have been pressure canning for some time, but I don’t water-bath can. I have cases of canned beef, canned pork, canned chicken, chili, stews, etc. All neatly labeled, cased up, and stacked in the pantry. Days when I’m out of town and my wife wants one of my signature meals, or when we’re late, or busy, or just lazy ;-), we dip into the jars for either a complete meal or pre-cooked meats to put something together quickly. I also shop on sale and store when I can buy super cheap for supper! I want to make homemade pickled pork hocks. How long should they be pressure canned and is the process different from the recipe above? Here’s my tip aka secret to amazing canned venison. I add 2 beef bouillon cubes per quart jar. Wow! I use the canned venison in every dish I use beef in. It is so tasty I take venison dishes to church dinners and such, no one can even taste anything “gamey”. As a matter of fact, I have fooled people who swear they can always tells when it’s venison and refuse to eat deer meat. We won’t eat it any other way at our house! Try it, you’ll be amazed! As long as the seal is still good, I’d still eat it! We just canned our first elk meat last weekend & it turned out great! I know vegetables process for a much shorter time, but have you ever done meat, potatoes & carrots in a jar together? A complete meal ready anytime! Or would the vegetables just be mush? I can the inexpensive beef roasts all the time. I watch for the sales and buy 4-6 large roasts. Then I cold pack it with table salt. I do NOT add liquid. Pressure can it for 75 minutes under 15 lbs. Love it! Your experience interest me. I have had Elk meat a couple of time. The first time it was really amazing, the second didn’t taste good at all. A friend that was an outfitter out in Colorado told me two things, one Elk has to be aged carefully, the second it matters where the Elk is harvested from. He says the meat harvested from the high mountains is better because of what there is for the Elk to eat. In the lowlands he says the Elk will actually eat on sage brush which can effect the taste of the meat. I have canned Deer many times. 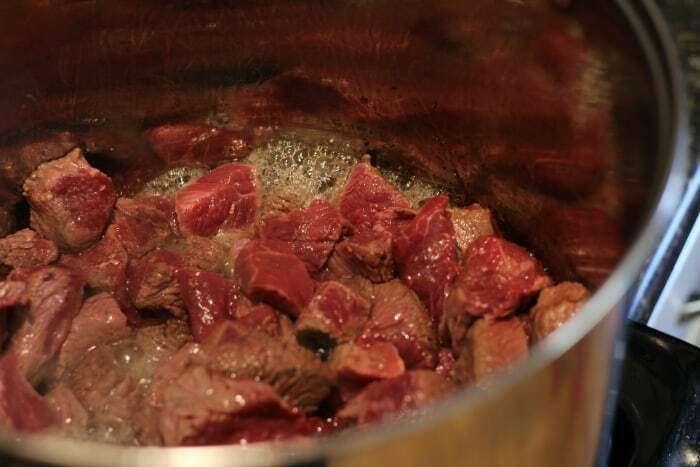 If it is an older deer that usually will be strong tasting I soak the meat for 2-4 hours in a salt water solution. After that I rinse it well then cook it in water. When filling the jars I use that water to fill the jars. Thus far the meat always comes out tasting very good. I would like to try canning beef liver and also beef heart. Any suggestions? Can you can meat in an instant pot? No– it’s not recommended to can anything with an Instant pot. I have been canning for over 30 years, wow I got old. Even before that I discovered cooking meat in a pressure cooker, has the same effect on meat, simply wonderful. Wife and I (mostly wife) canned for a long time with a standard canner. About eight years ago we purchased a second canner. The new one is tall, you can stack pint jars on top of one another to make 16 jars per load, highly recommend the tall one, expensive but worth the money. Time is something there never seems to be enough of when you need it the most. Proving this information for folks says you have a good heart Jill. I’m new to pressure canning. I recently canned chicken from the directions you gave. It came out awesome! I eat it right out of the jar or make chicken salad sandwiches.? Today I canned a couple of roasts that I had in the freezer but I combined two recipes,by accident. I browned the beef, put about a Tbls of broth in each jar and processed for 75 minutes. There isn’t a lot of liquid in each jar. Is the meat still okay to eat later? I should have added liquid to the top or raw packed but I mixed them up. They are sealed so will they be ok? My husband said the meat can not be proscessed first? Is this true? We just got our deer back after taking it to the local meat place that processed and packages dear meat. So does it have to be fresh kill or can I still can using what was packaged? Thanks! Just a couple of quick questions. First, instead of browning the meat in a pot, could I quick sear over a very hot flame? And would canning preserve that “fresh grilled” flavor and smokiness, or would it just become a gummy bitter mess? Okay… three questions… could I can pulled pork with a slightly acidic barbeque sauce without destroying the texture of the meat? Oh, my goodness, I remember when I was first learning how to pressure can meat! 🙂 I was certain that canner was going to explode. Literally, I would open the fridge door and hide behind it, cautiously peeking out. I figured it was built solidly enough it would save my life if it exploded. I can get beef liver for free and would like to can it in chunks and not packed tightly for my dogs. Have you done anything like this? I can understand not canning pate, but wonder if you have tried to can liver yet. I noticed that you wanted to can beef heart. How has this worked? I want to raw pack boneless chicken breasts. 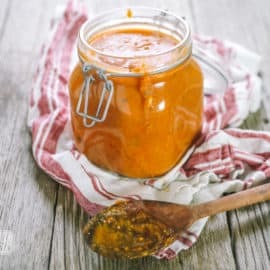 If I don’t have any chicken bones (or am too lazy) to make broth to add to the jars, can I add a few small pieces of carrot, celery & onion to the jars prior to placing in canner? I have to be careful eating sodium so I’d rather skip bullion, even the low-salt variety. Has anyone tried using a small amount of veg in the jar to season the chicken & basically end up with some flavorful broth? I also wanted to know if I can marinade raw beef cubes prior to raw pack canning. I would not be adding the marinade to the jars. Just wondering if the flavor would intensify after processing & then sitting in pantry. Any comments? Any brave soul “played” around with flavoring raw pack chicken or beef? Thank & like your blog!! I know this is a older post but maybe someone can help me! I’ve canned for years but I’m new to canning meat. I just used a pressure canner to can pulled pork and the pressure canner boiled dry- I was busy and wasn’t watching as close as I should have and the heat was too high. The processing time was only 1 hour instead of 90 minutes. Can I still use the meat, if I really heat it through for 20-30 minutes,or do I need to throw it out? I was going to throw it out, but after reading other comments here about pouring lard over the pork and canning it that way, I’m not sure! Thanks!